This section is actually the history of two manufacturers, Autocoast and Shadow, who’s stories are intertwined. The Autocoast Ti22 debuted late in the 1969 Can-Am season, at Laguna Seca. Designed by Peter Bryant, the car was a reflection of the rule changes that were to go into effect for the next season. For 1970, rear wings would have a maximum height of only 31 inches, so downforce would need to be generated in different ways. Bryant chose to make the car a single aerodynamic device. In addition, the monocoque chassis would be built of both aluminum and titanium. Much of the suspension was also made of titanium. It was chosen because the car needed to be very strong and very light. Titanium is 60% lighter than steel and is much stiffer than aluminum. This was the first time that titanium was used in any quantity in a car. Hence, the name “Ti22”, which is the atomic symbol and weight of titanium. Power came from the ever popular Chevy V8. In that first outing at Laguna Seca, the Ti22 finished 13th. At Riverside, it officially exited the race (after qualifying fourth) with transmission problems. In reality, a titanium suspension piece had broken, but the team was courting the Titanium Metal Corporation as a sponsor for 1970, so they wouldn’t admit that a titanium item had failed. Engine failure stopped the Ti22 at the last Can-Am race of the year and at a race in Fuji, Japan. Jackie Oliver, who drove the car in 1969, returned to drive it in 1970. He qualified fourth and finished second in the season opener, after leading several laps. Disaster struck at the second race of the season, as the Ti22 cart-wheeled off the track on the first lap. Oliver walked away from the wreck but the chassis was totalled. The team did not get a new car on the track until the final two races of the season. Oliver did manage a pair of second place finishes in those two races. Also in 1970, Don Nichols built the Advanced Vehicles System (AVS) Shadow. Like Autocoast, they used the conventional Chevy big-block engine. However, nothing else on the car was conventional. The fundamental design principal behind the Shadow was reduced aerodynamic drag, which was to be achieved by having minimal frontal area on the car. This became possible when Firestone agreed to develop tires that were 30% smaller in diameter than those in use at the time — 17 inches in the front and 19 in the rear (as opposed to the normal 24 and 26 inches). Unfortunately, smaller tires meant smaller brake rotors, which had less stopping force and didn’t dissipate heat fast enough. Also, because there was no room for the radiator in the body it ended up being mounted in the rear wing, which didn’t work well. Other innovations were originally included in the Shadow, but they were slowly compromised as things didn’t work out as planned. George Follmer drove the car twice and Vic Elford once. It finished none of the races, although Follmer did qualify fifth fastest for the season opener. There was a “meeting of the minds” in 1971. Through “business” maneuverings, Bryant lost control of the Ti22. (The Ti22 only raced twice in 1971 with David Hobbs at the wheel, and failed to finish either race.) He and several other people from the Ti22 project, including driver Jackie Oliver, joined forces with Nichols, to build and race a slightly more “normal” Shadow. With the signing of Universal Oil Products as sponsor, the UOP Shadow team was born. The Goodyear tires used in 1971 were larger than before (18.8 and 22.3 inches) but still smaller than conventional Can-Am tires. They were about the size of that day’s Formula One tires. About the only titanium in the new car, was a pair of struts attaching the engine to the back of the chassis tub. The overall shape of the Shadow MkII was of a low wedge with “fences” running down each side of the body and a wing in the back. The car was painted in various forms of back and white — usually all black with white lettering, but sometimes white on top and black on the sides. One time, it was painted all white with black lettering. All paint schemes were very stark and very attractive. The car, however, was still not a success. Although Oliver usually qualified the car well (including one pole position), it only finished one race (third at Edmonton). In 1972, the team finally abandoned the low profile tires for conventional rubber. The larger tires meant that the body of the MkIII, though of similar shape to the 1971 MkII, was now taller. The radiators were moved to the sides of the car and a wing placed between the front wheels, just as McLaren did with their M20 this same year. The team also began testing a turbocharged Chevy V8, but didn’t race it. Unfortunately, their 1972 season was no better than 1971, with Oliver only finishing one race (and in third, like 1971). For 1973, Shadow built an all new car, the DN2. (Shadow had also started racing in Formula One, with that racer known as the DN1. DN standing for Don Nichols.) Tony Southgate had replaced Peter Bryant as designer. The car had a “shovel nose” similar to Lola’s T310 of 1972. It was also designed to use the 1200 hp turbocharged engine they had been working on. The engine was only raced three times and never worked well. Therefore, they were forced to use a normally aspirated Chevy, which didn’t have enough horsepower (735) to move the DN2’s heavy chassis quickly enough to keep up with the now dominant Porsches. The car did not handle well, either. 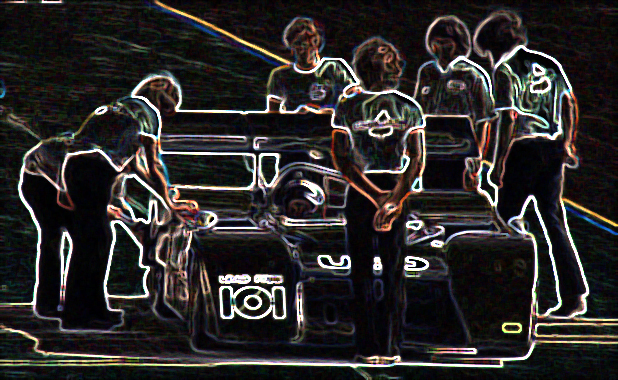 Mechanical problems also continued to dog the team, resulting in only two finishes (third at Edmonton and second at Laguna Seca) in eight races. For 1974, Shadow was the only team to field new cars as the Porsche, Lola, and McLaren factory teams had all pulled out of the series. The new DN4, although looking very much like the DN2, was smaller and lighter, to take advantage of the series’ new fuel economy rules. (Cars would now have to get 3 mpg or better.) Shadow entered two cars in 1974 — one for Jackie Oliver and one for 1972 Can-Am champion George Follmer. Both cars were powered by 800 hp, 495 cubic inch Chevy V8 engines. The team finally got it right. In five races, Follmer had one pole position and three second place finishes, while Oliver sat on pole three times and won four races and the championship. After five years of trying, Don Nichols finally had his championship. Unfortunately, the Can-Am ceased to exist after he had won it. After the Can-Am season ended, the team put on a pair of exhibition races. Only Shadows participated in these races. Before the United States Grand Prix at Watkins Glen, Follmer beat Oliver and Jean-Pierre Jarier. All drove DN4s. Later, before the Laguna Seca F5000 race, Follmer and Oliver in Can-Am DN4s were beaten by Jarier and James Hunt in Formula One DN3s. Finally, at Mosport in 1975, Can-Am cars raced in anger for the last time. Oliver drove a Shadow DN4 to victory in a one-off “Formula Libre” race, beating various endurance prototypes and other Group 7 Can-Am cars. An era had ended. Shadow went on to race in Formula One, with little success, until the early eighties. Before Shadow folded, Jackie Oliver, who had become Team Manager, and several other “disgruntled” Shadow employees left to form the Arrows F1 team.